If you’re the proud owner of an acoustic piano, follow these tips to lengthen its lifespan. First, if you need to move a piano at any time use experts. Be careful to only use professional piano movers. Regular movers might think they’re being careful, but dings are almost inevitable on such a large piece. On a piano, a small ding might make a difference. Cover the keys with the fallboard when the piano’s not being played. If it’s not going to be played for a while, cover it with a drop cloth. 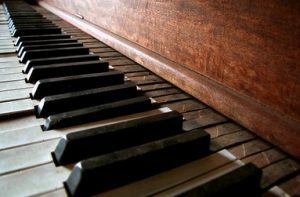 The most enjoyable way to take care of a piano is to simply play it regularly. It keeps the piano in good working order. Dust the piano every other week or so. Clean the keys with mild soap and a damp cloth but don’t let them be damp for an instant longer than they have to be. Never use solvents or any other harsh chemicals on the keys. Though it may be tempting, don’t open up the piano and dust inside. That is the job for a professional. Indeed, it’s a good idea to find a technician who does know how to keep the piano’s innards good shape.